Anna Hovet is the Lead Designer of HOVET Apparel (formally Anna Hovet). Known as the "Queen of Comfort", designer Anna Hovet was born and raised in Grand Forks, North Dakota, Anna moved to Chicago and earned her BFA from the School of the Art Institute of Chicago in 2007. After graduating, she was hired by Kids Headquarters where she designed layette for Ecko, Calvin Klein, Kenneth Cole, and Target. Due to the economy, Anna was laid off from her job and founded her own company in January 2009. Over the last 6 years, Anna Hovet has become one of most recognized names in Chicago fashion. Anna also owns a private tutoring company, Sophic Standard LLC, and teaches fashion illustration at the School of the Art Institute of Chicago. View her Tedx Talk HERE. Within the first few months of the launch, her designs were featured in Lucky Magazine and worn by Jennifer Hudson. In May 2009 Anna was selected as a Designer in Residence at the Chicago Fashion Incubator - A City of Chicago sponsored program to help fashion designers start a business. She has appeared on NBC "1st Look" and was a contestant on the Kenmore Reality Web Series "So You Wanna Be A Designer". Anna was named one of Refinery29's "30 Under 30" in 2012. Her designs can be seen on comedian Hannibal Buress and have been featured in several publications including the RedEye, TimeOut Chicago, and the Chicago Tribune. 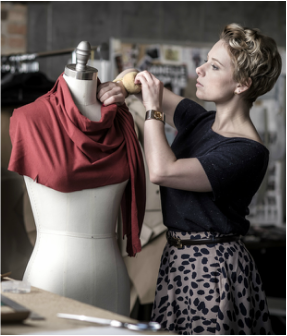 In June 2015 Anna Hovet was awarded "Chicago's Best Local Clothing Designer" by the Chicago Reader. See full Press Kit HERE.